Travel Time: About 45 to 60 minutes after leaving the terminal. 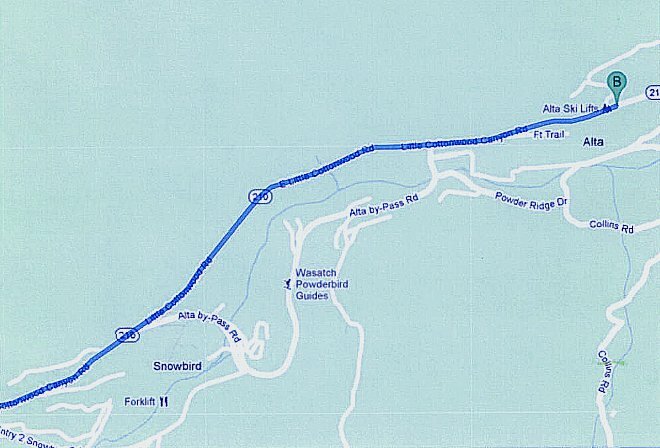 Anticipate delays on weekend mornings between 8:30 am and 10:30 am due to skier traffic on the road to Alta. – I-215 SOUTH (this highway leads south, then east toward the mountains). Stay on this road for about 15-20 minutes. You will take the next exit after 2000 East. – Exit 6 at 6200 South (signs indicate Alta and other ski areas). After exiting, turn right. From this point, there are no more turns; just follow the road to Snowbird and Alta. The road will be signed as Wasatch Blvd., then as St. Hwy. 210. * A 7-11 store on your right as you pass through a large intersection. * At the entry to our canyon (Little Cottonwood), an electric sign with road and weather information. * From the sign it is about 9 miles up the canyon (passing Snowbird) to Alta. * The Alta Lodge entryway is on the right side of the road, and the Lodge is several flights of stairs down. Travel time: Allow 45 minutes to 1 hour under normal, non-rush hour driving conditions. Early morning rush hour, snowy days, or weekends and holidays between 4:30 and 6:00 pm (when skiers leave Alta and Snowbird) may require considerably more time. – Follow the canyon road down toward Salt Lake City. Where the road leads out of the canyon (at the electric sign), stay right. This road becomes Wasatch Blvd. and continues along the base of the mountains. Follow it, making no turns, to highway I-215. – Take I-215 West (pass under the freeway and turn left on to the freeway entry). – After about 15 minutes, you’ll see airport exit 22B. – Bear left, towards I-80 West. You’ll see the airport in front of you and then to the right as you follow the offramp around to the left. Follow this offramp/road for about 2 miles. You will not get onto I-80W, rather you’ll drive parallel to it before bearing right into the airport itself.